"Music is an integral part of the holiday season, and jazz is one of the liveliest musical genres to play or experience, so it probably isn't a surprise that student musicians from New Trier High School and Wilmette Junior High School helped usher in the 2016 holiday season with a Dec. 2 joint jazz concert." according to Kathy Routliffe, Writer. Dan Nicholson, a professional jazz saxaphonist, adjusts the reed on New Trier Jazz Ensemble 1 member Griff Parry's tenor sax before the joint New Trier High School-Wilmette Junior High School concert, held Dec. 2 at the junior high. Nicholson and two other Chicago area jazz players performed with the students. The concert, which took place at the junior high school, showcased pieces performed by the seventh grade jazz lab band and the 8th grade jazz band, said WJHS teacher and band leader Kimberly Farris. The two combos comprised about 35 students, Farris said. The performance also featured music from about 90 members of four high school ensembles, according to Nic Meyer, director of jazz ensembles at New Trier. Three professional Chicago area jazz musicians – saxophonist Dan Nicholson, trumpeter Marques Carroll, and trombonist Steve Horne – were also on hand to solo with the groups, Meyer said. 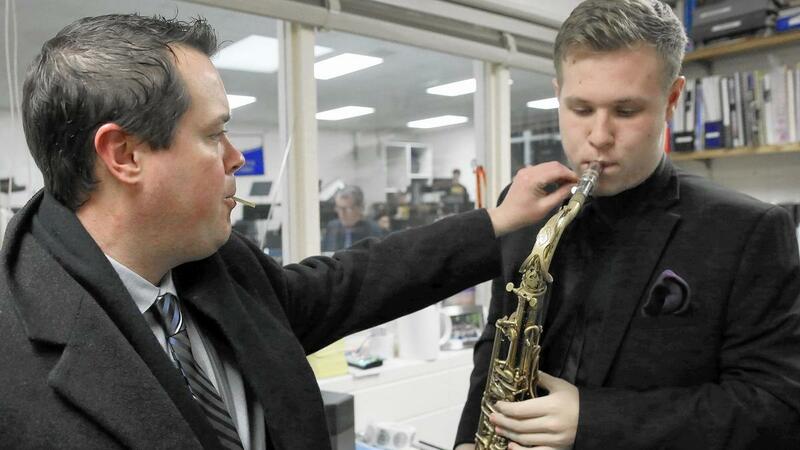 "One of the cool things about this is that the audience is going to get to see the progression of musical development, from our seventh grade jazz kids, all the way through the senior level at New Trier, which is amazing," Farris said. In fact, members of New Trier's advanced jazz ensemble joined forces with musicians from both of the junior high groups at the end of the evening to perform one piece, "Blues by Five," by jazz great Red Garland, Meyer said Dec. 1. "We got together once today," he said, "and practice went great. All three groups had practiced the piece separately, so it was just a matter of putting everything together." Farris and fellow District 39 band teacher Ann Dufek have worked over the past few years to increase the number of collaborative events with New Trier, Farris said. "We've done other collaborations, but this is the first time we've had a collaboration with the jazz program," she said before the concert. "Our kids will be able to work with Mr. Meyer, to get to work with him and the high school kids. We're super excited." Work on this concert began at the end of the 2015-2016 school year. Meyer said the decision born out of both practical concerns and his appreciation for the WJHS auditorium.